Avene Hydrance Optimale Rich is formulated with patent-pending ingredients to provide long-lasting hydration to help restore smoothness and luminosity. 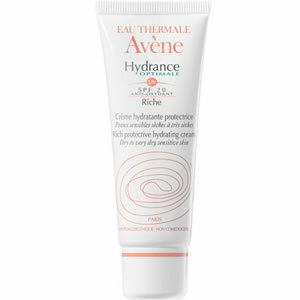 Avene Hydrance Optimale Rich contains Avene thermal spring water to soothe and soften and provides long-lasting hydration to help the skin regain its balance and replace its barrier function. With continued use of Avene Hydrance Optimale Rich radiance is restored, skin feels soft, looks smooth and healthy and fine lines are minimised.